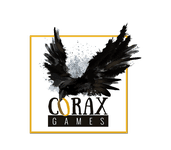 'Corax Games' is a German publisher founded in 2016. The main focus is to localise foreign Games for the German market but the company also creates one or two games per year on its own. Corax Games is a Happyshops brand, the same company that runs Spieleschmiede and Spiele-Offensive.de in Germany.